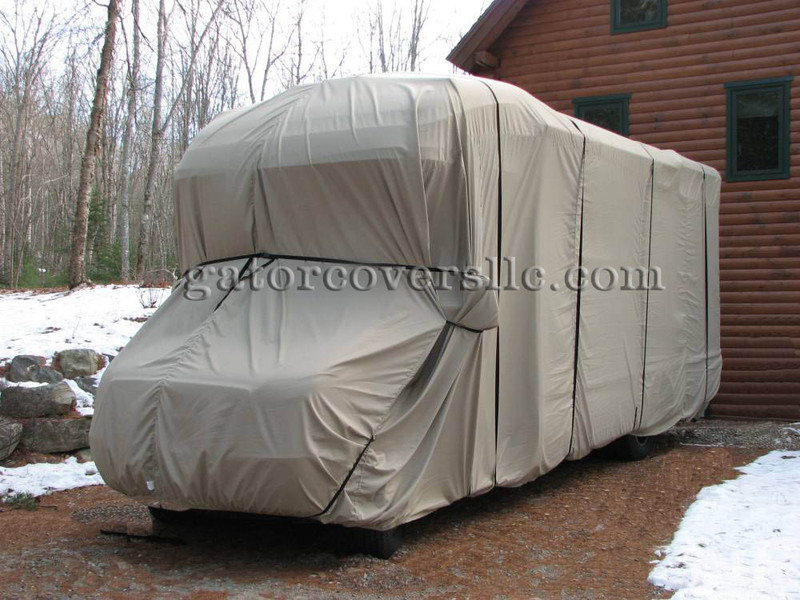 This cover fits Class C RVs. It's available in a choice of lengths, and fits RVs that are up to 104" tall and 102" wide. Two 96" zippers run vertically along the side wall for easy access to the doors. Next to each zipper is a 12 foot strap that runs under the vehicle to secure the cover. The front and rear of the cover has elastic in the hem for a snug fit. At the front of the cover are adjuster straps to further tighten the cover. Four forty foot adjustable tie-down straps are included. These straps wrap around the entire vehicle and snap shut with a quick-release buckle. A Reinforcement Kit is included. Use this kit to reinforce areas where excessive wear might occur.